While most riots usually last a day or two, the Nika riots in 532A.D. lasted a week, and today the riots are known as the deadliest ever, with thousands left dead throughout the city. Half of the city was burned to ashes and debris and the number of people who died is truly shocking. The riots took place in Constantinople at the Hippodrome and turned very violent after the news of the emperor of the time, Justinian I, not bringing releasing two men who were accused of murder. The name of the riots, “nika” means conquer, which really sets the stage for the riots. Those who participated often shouted the word. In the fifth century, chariot races and other type of Olympic-like games were very popular. Just like in today’s world, there were teams that would compete against each other to become the champion. The two teams of the time of the riots were the Blues and the Greens. Justinian was very fond of the Blues and definitely made this known. However, a few days before the riot started, players from each of the teams was accused of murder and sentenced to execution. Many of the team members were hanged but somehow the execution was botched and one member of each team escaped and went into hiding at a church sanctuary. People called upon Justinian to have these men released; instead, he had the church secured by guards. At the games people called for the release of the men, but Justinian did nothing, and the violence started. Rioters banded together and began to set various buildings on fire, including the Hippodrome after the emperor decided to hold even more chariot races the next day. 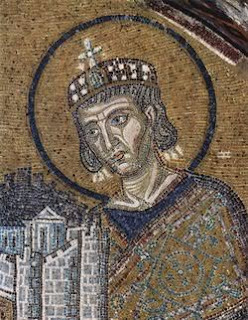 As the city grew more out of control, those who worked with Justinian, his senators, decided this was an opportune time to overthrow him as they did not agree with his new tax laws. Because of this, the senators joined in on the rioting and called for a new emperor as well as for John the Cappadocian and Tribonian step down for supporting Justinian’s tax ideas. However, this did not happen and with the rioting continuing, Justinian had two of his guards go to the Hippodrome and lock the doors to keep the people inside. The two men then killed everyone who was inside. By the end of it all, 30,000 people were dead and a majority of the city was left in a disastrous state. Justinian did eventually have the city rebuilt after he exiled those who turned against him.